I found Kerrisdale’s case pretty strong. I do think there might be a niche use for the frequency, but not a substantial one. For me, the biggest problem with the technology is the low power requirement. While the license is for the entire U.S., there is no way you can provide nationwide coverage with the low power requirements. The bulls want Netflix to buy it and transmit movies over their spectrum. But this would require Netflix to build a tower every few hundred feet – its not gonna happen, nor is the FCC going to allow high power in a band adjacent to low power users. TLPS is a solution seeking a problem. What is basically happening is that cable providers are turning every single cable modem in every household into a public WiFi hotspot. But this doesn’t help GSAT since this is 1. a smart use of equipment that is already installed in million homes and 2. works just fine on free WiFi channels. A fourth channel only has some potential value in super busy spots like hotels, convention centers, stadiums etc. I can see how it would be a desirable feature in high-end WiFi access points. Still hard to get even that limited use case to work since you need support from consumer electronics manufacturers to make it happen. Have a look at comments’ stream on VIC article. There are a number of really strong counter arguments for Kerrisdale case. I did read it. What do you think were the really strong counter arguments? 1. Binary type of investment where Kerrisdale valuation thoughts might be unrelated to the final outcome. A single buyer of spectrum can burn all the short sellers. If management acted irrationally by not selling at high prices, maybe couple of irrational spectrum buyers will also bid up the prices of the spectrum. So Kerrisdale might be right in their value assessment, but spectrum could still be bought at high prices. Just consider the whole Snapchat/Facebook situation – crazy amounts are being paid for assets that seemingly lack value/monetisation prospects. 2. Also if I remember correctly comment from Greenshoe outlined a spectrum valuation case where $4bn for this asset is not something out of the blue. 3. Management does not act as if it is promoting the stock (no selling of shares even at very high prices). So if Kerrisdale case is true then management must be completely dumb to continue owning all of the stock even at inflated prices. Another option is that management understands better the true value of the company (maybe even had some talks with the buyers). The later point seems quite unlikely especially after listening for GSAT responce to Kerrisdale thoughts. But lack of selling by CEO is still very hard to explain. 4. Also (not from VIC comments) satellite assets are considered worthless as satellite operations do not produce any cash. However, that might not be the case for the potential acquirer, which might find a way to utilize the network efficiently. GSAT has spent >$1bn over the last 10 years to launch the network of its satellites, so at least there is replacement/build-out value in there. I have no position at the moment and currently kind of siding with Kerrisdale’s opinion. But considering the risks above , I do not think it is a good short at current prices (you probably have entered somewhat higher). If FCC approval or CEO purchases (he promised he will buy more) pushes the share price i might reconsider. 1. Agree, but basically a risk with every single short thesis. Always a risk of a greater fool. Don’t think GSAT is fundamentally different from other valuation based shorts. 2. 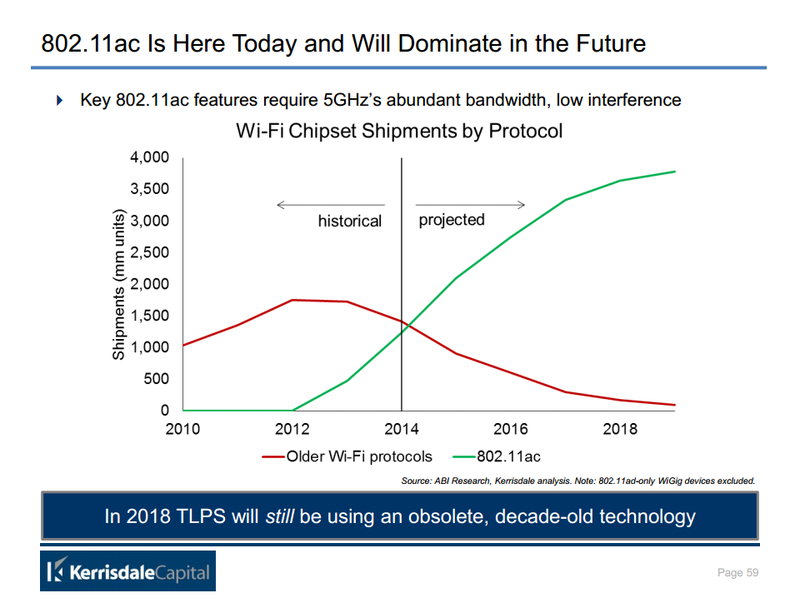 That valuation doesn’t make a whole lot of sense to me, starting with the idea that there are 1 million of locations where WiFi congestion is a problem / will be a problem in the future. If that’s your starting point you can hit any revenue number. Also a big flaw in his idea is that you can have just one 5GHz access point in the area of one 2.4GHz access point. It’s easy to create many small 5GHz cells in the area of a single 2.4GHz access point coverage area. How much value does a single ~100Mbps 2.4GHz channel have if you can have a couple of 5GHz access points that each offer ten times the bandwidth of the 2.4GHz channel (and remember: we still have the free 2.4GHz channels as well). Also if his use case is that people want to use a massive amount of data using WiFi and want to stream for example 4K video: that will _never_ be possible on 2.4GHz. You will need 5GHz for that anyways… and if you have coverage with 5GHz you only need 2.4GHz for legacy devices because you automatically have the bandwidth capacity. 4. Problem is that you can’t really do anything else with the network. You can’t upgrade satellites because they are in space, and even if you could you still have the bandwidth/latency issues that delegates the tech to a role in a niche market. Can’t beat physics.